Home » bbc , doctor who , reviews , science fiction , television » "Day of the Moon": This week's DOCTOR WHO makes Chris numb all over his gray matter! "Day of the Moon": This week's DOCTOR WHO makes Chris numb all over his gray matter! The one bit of British television that I had my DVR set to record this week (and I mean that in a good way too), tonight brought the second episode of the sixth season (or the thirty-second season, if we're counting to the show's very beginning in 1963) of Doctor Who. Picking up from "The Impossible Astronaut", "Day of the Moon" continues the first Doctor Who story to be filmed in the United States. I watched "The Impossible Astronaut" twice more over the past week and had my expectations set high for Part 2. I don't know what precisely to say but, alternatively, "WOW!" and "HUH?!?" 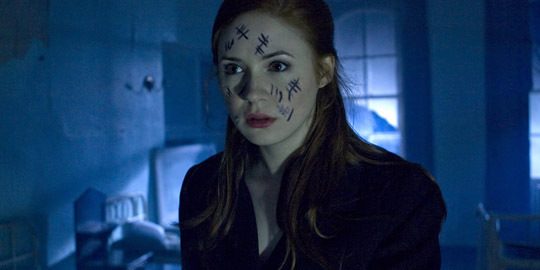 The episode picks up three months after last week's episode, still in 1969 and on the eve of the Apollo 11 launch, with Amy Pond fleeing across the Utah desert. Her pursuer? None other than Canton Delaware... who is also seen chasing down Rory and River Song. And curiously, all three have tally marks covering every exposed inch of their skin. Meanwhile the Doctor is being held prisoner at Area 51 (Matt Smith giving us the most disheveled-looking Doctor in the history of anything). And somehow from there we get to an abandoned orphanage, to the cockpit of Neil Armstrong's command module, to the streets of New York City... in what has to be the most dizzying and mind-warping tale that Steven Moffat has ever weaved in all the years that he's been writing for Doctor Who. But don't fret. It all makes sense in the end, as the Doctor and company set out to rescue humanity from the Silence: an alien race that has been running amok on Earth for, it turns out, thousands of years. And in classic Moffat fashion, it's like the best magician's tricks: being done right in front of our eyes, without us even realizing it until the Doctor's moment of triumph. "Day of the Moon", I'm almost afraid to say that this sets the bar way too high for the rest of the season. This is practically season finale material, friends and neighbors. Karen Gillan continues to be a pleasure to watch as Amy, and Arthur Darvill's Rory is beginning to grow on me more as a regular companion to the Doctor. But the real delight, as in every episode that she appears in, is Alex Kingston's River Song (just wait'll you see her gunplay). Also have to give props to Stuart Milligan's portrayal of President Nixon, for whom Moffat took a considerably high-brow approach toward writing (it might be the best treatment that Nixon has had on the television medium in decades). "Day of the Moon" gets this reviewer's full FIVE Sonic Screwdrivers in rapturous approval! And that would have been even without the shocker of a final scene... which is almost certain to set tongues wagging about Doctor Who mythology more than anything in many, many years. I agree with you Chris, what a barn storming episode, cannot recall a season opener as strong as this. The structure of the episode, dark undertones laced with tension, were the episodes that I loved as a child, the ones that make you think but scare you! And the ending?! Oh my! To think people in some forums are blything suggesting "Yeah, I saw that coming" ... REALLY?!!! I didn't and I'm massive Doctor Who nerd! Next weeks looks fairly average season filler material but regardless if it is, this series being filmed in HD with good use of special effects (coupled with Moffat's writing obviously) makes is going to make it a truly joy to behold.